Giti Tire, which manufactures passenger and light truck tires in Chester County, SC, is encouraging youngsters there to get involved in math and science. RICHBURG, SOUTH CAROLINA, USA, April 15, 2019 /EINPresswire.com/ -- From describing the Earth’s continental land forms to applying physics to an egg drop, Chester County students demonstrated impressive STEAM skills in this year’s Giti Math & Science Award which concluded with an April 11 awards ceremony. 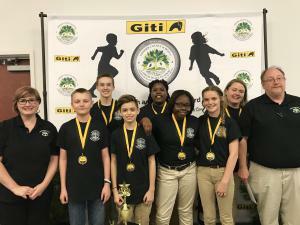 For the 3rd year in a row, Giti Tire sponsored a STEAM (science, technology, engineering, arts and mathematics) competition with the Chester County School District, South Carolina, where the company has a passenger and light truck tire manufacturing plant. A winning entry was selected from each of the elementary, middle school and high school divisions. Chester Park COLT won the elementary division. Great Falls Middle School and Lewisville High School won in their respective divisions. The entries were judged on April 9-10, and the winning teams were announced on April 11 during an awards ceremony at the Gateway Conference Center in Richburg, SC. Elementary school team – Develop and use models to describe the characteristics and classifications of the Earth’s continental landforms with emphasis on volcanoes. Middle school team – Plan and conduct controlled scientific investigations to design and create a simple machine to help transfer mechanical energy by reducing the amount of force required to lift a two-pound weight. High school team – Apply physics principles to design and create a device that minimizes the force on an egg during a vertical drop and construct an explanation for the design. The entries were judged on: design, written report, collaboration, presentation with a clear use of math and science in the process. Students apply at the beginning of the school year to become a member of the Giti Math and Science club. The club meets at least 12 times between September and April. One of the largest tire companies in the world, Giti Tire Group, (headquartered in Singapore) has been in the tire business since 1951. Giti Tire operates 8 manufacturing plants and produces a broad range of tire products, serving major original equipment vehicle manufacturers, auto-service outlets, tire dealers and consumers in more than 130 countries worldwide. Giti Tire (USA) Ltd., based in Rancho Cucamonga, California, is the sales, marketing, and distribution company for North America. It markets and sells a family of brands: GT Radial, Primewell, and Dextero tires for high performance vehicles, passenger, SUV, light truck, and medium trucks through national retailers, independent retailers and distributors across the United States and Canada. For more information, please visit www.giti.com.